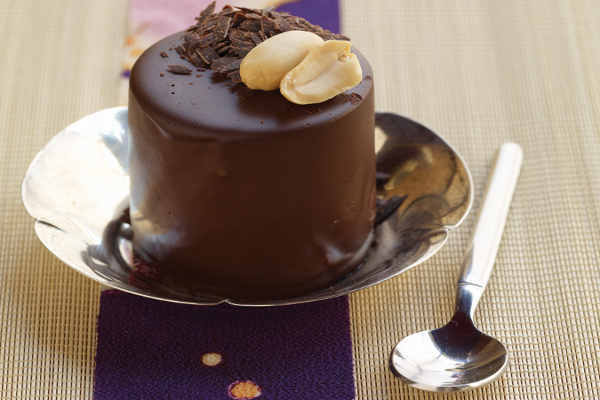 With the holidays ahead, we love to finish off a meal and dazzle our guests with a great dessert, and what better way than to do it with chocolate mousse. The recipe below has been a hit at our holiday table for years. The recipe for whipped coconut cream is a wonderful addition to fruit, gelatos, and pies as well. The secret is to use the best ingredients you can find, particularly the chocolate, and make sure that the soft tofu is fresh. Melt the chocolate chips in the microwave on 50% power for about 2 minutes, stirring frequently until melted and smooth. Set aside to cool. Put the tofu, maple syrup, and melted chocolate mixture in a blender and process until smooth, about 3 minutes. Add more maple syrup if needed, depending on sweetness of soymilk. If you want to unmold the mousse later, lightly coat six 3 by I-inch ring molds or ramekins with a mild oil. Otherwise fill into serving dishes. Divide the chocolate mixture equally between the molds and chill in the refrigerator overnight. Just before serving, unmold and garnish with chocolate shavings and nuts, if desired. Variations: add a pinch of cinnamon for a Mexican chocolate taste, a shot of espresso if you want to go Italian, rum flavor instead of vanilla if you feel Carribbean, a bit of cognac or orange liqueur if you feel French, and a pinch of hot chili powder if Texas is your thing. If you don’t want to unmold, you can layer the mousse with some festive cherry pie filling and lady fingers and you almost have a Black Forest cake in a dish. But it is also heavenly on its own, and none of your guests will notice that it is purely vegan. The whipped coconut cream finishes it off beautifully! Refrigerate the can of coconut milk until cold. The coconut cream will rise to the top. Open the can without shaking. Spoon out the cream that rose to the top (don’t throw out the coconut water but use for drinks or in cooking). Transfer coconut cream to a bowl and whip. When softened, add maple syrup and vanilla and beat until soft peaks form. Leah from the Brazen Kitchen, who invented this method, loves to put black pepper in it! Reblogged this on Venus es mi planeta. This entry was posted on December 23, 2015 by Vox Populi in Health and Nutrition and tagged Chocolate Mousse with Whipped Coconut Cream (gluten free), Gluten free desserts, The Vegan Kitchen, vegan desserts.